GAINESVILLE, FLORIDA–Steph Bosch (’14), Lizzie Reinthal (’14) and I flew out of icy Ohio this weekend to attend the 10th North American Paleontological Convention in warm, sunny northern Florida. 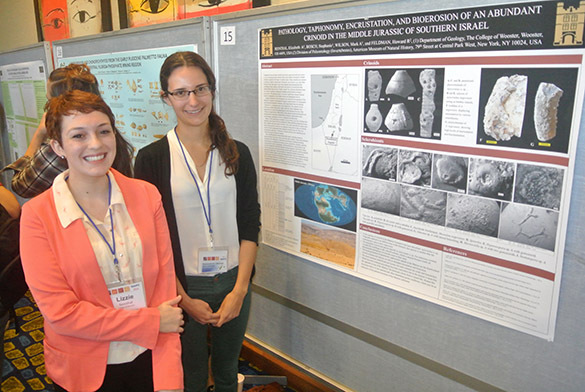 The students jointly presented the beautiful poster above on their Independent Study projects in the Matmor Formation (Middle Jurassic, Callovian) of southern Israel. It was very well received, especially with the addition of fantastic scanning electron microscope images of bryozoans produced by our colleague Paul Taylor at the Natural History Museum in London. 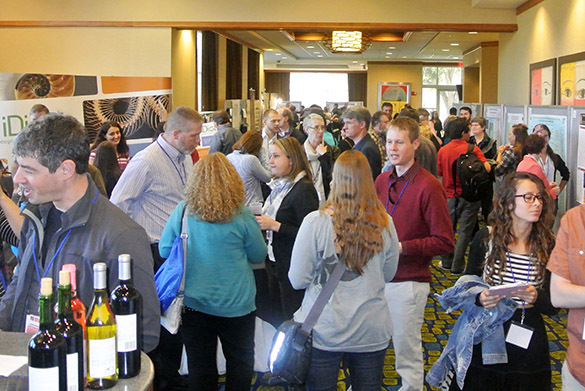 Here’s a crowd scene from the first poster session at NAPC. If you look closely in the center, you’ll see two Wooster alumnae who are prominent paleontologists. Can’t swing a cat at a paleo meeting without hitting Wooster Geologists. This is a nondescript image of our hotel and convention center in Gainesville. I show it only to marvel in the blue, blue sky and perfect temperatures. We are on the University of Florida campus near the Florida Museum of Natural History. The paleontology staff at that museum is sponsoring this meeting — and they are doing an extraordinary job made more complex by the absence of about a third of the participants still snow-bound in the north. We escaped through a window of clear weather in Ohio. 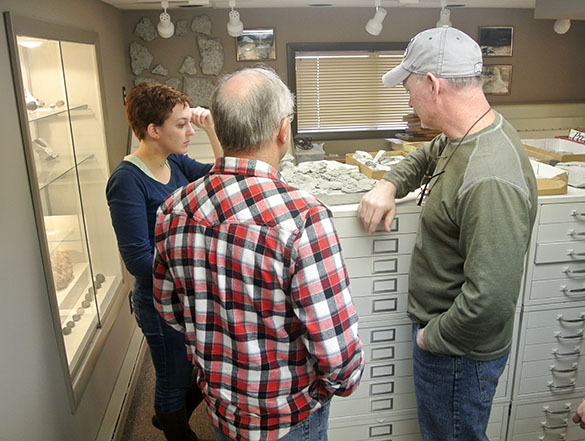 Last week three Wooster geology students and I visited Ken Karns, an enthusiastic citizen scientist who has developed an extraordinary fossil collection in his home in Lancaster, Ohio. Ken is a man of prodigious energies and skills as he not only is an expert fossil collector and preparator, he also has a world-class curated collection of Ohio beetles! He was introduced to us by our friend Brian Bade, a man with similar enthusiasms and skills. The students were Steph Bosch (’14), Lizzie Reinthal (’14) and Ian Tulungen (’15). Our goals were to meet Ken, see his magnificent collection with Brian and other friends, and then focus on a project for Ian’s future Independent Study work. Success on all counts, and the specimen above is evidence. Ken was very generous in loaning this specimen to us along with several others for Ian’s work. In this different angle on the specimen you can see additional encrusters (sclerobionts) on the surface of the Platyostoma shell. In the lower right is a remnant of a sheet-like bryozoan, but the most prominent sclerobionts are the tubeworms Cornulites proprius Hall 1876. These encrusters interest us very much. In this closer view it is apparent that several of the cornulitids are aligned with their apertures pointing in the same way. This is a pattern we’ve seen on many of these snails. 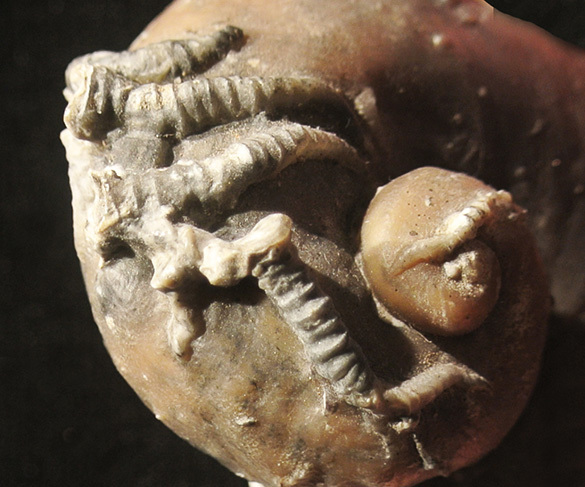 Platyostoma was a parasitic snail that lived attached to crinoids, which were abundant in the Waldron fauna. They lived high on the calyx of the crinoid firmly fixed to its skeleton. These cornulitids and other encrusters were thus living high off the substrate perched on the snails. They were filter-feeders like the crinoids, so they may have been feeding on some suspended food fraction missed by the crinoid arms, or they were competing for nutrients and added to the parasitic load on the poor crinoids. 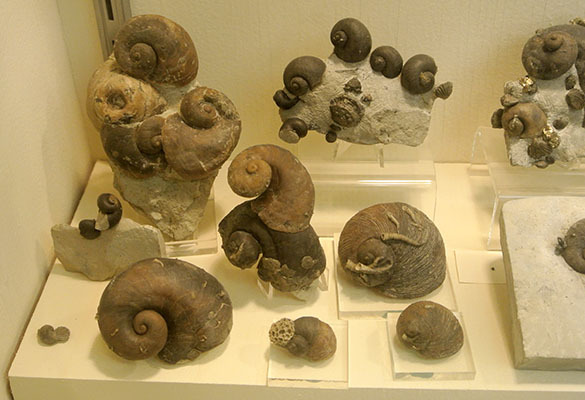 The cornulitids were further living on a living snail shell, from what we can tell, so they grew with a substrate slowly growing underneath them. This produces all sorts of delicious paleoecological questions to sort out! Check out the size of this specimen of Cornulites proprius attached to another Platyostoma niagarense. Clearly these tubeworms could do very well under these conditions! This is the largest cornulitid I’ve seen. 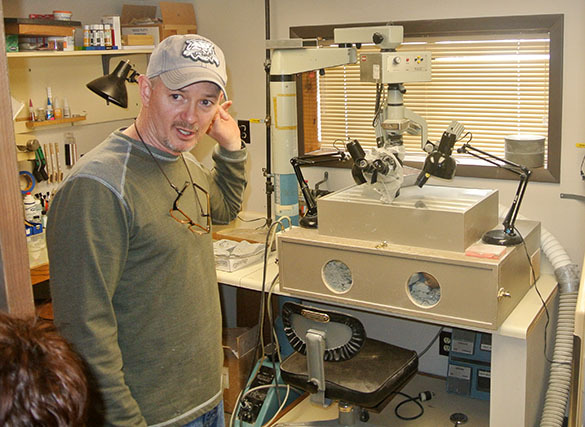 Here is Ken Karns in his fossil preparation laboratory, which he assembled himself. The box with the armholes is for air-abrading specimens to remove matrix. This is one section of the display cases Ken has in his basement museum. Most of the specimens shown here are from the Waldron Shale. A closer view of a display of Platyostoma from the Waldron Shale. Note the many encrusters. Lizzie Reinthal, Brian Bade and Ken talk about fossil preparation with some Waldron material. 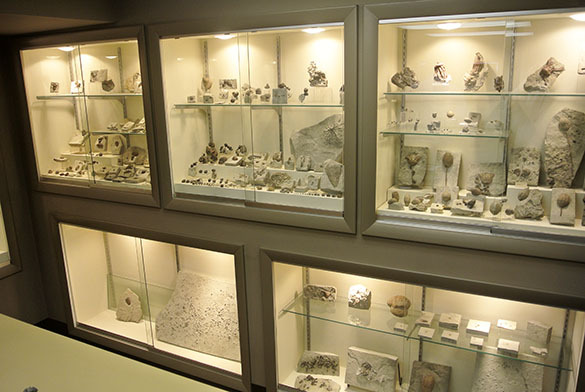 The cases are full of curated specimens. There are so many treasures in Ken’s collections. I am fascinated by this little slab showing the holdfast of a crinoid with sheet-like bryozoans encrusting it. The bryozoans show that the roots were at least partially exposed at some point. Thank you again to Brian Bade for arranging this trip, and Ken Karns for being such a fantastic host. We are looking forward to many Waldron projects in the future! Baumiller, T.K. 2003. Evaluating the interaction between platyceratid gastropods and crinoids: a cost–benefit approach. Palaeogeography, Palaeoclimatology, Palaeoecology 201: 199-209. Baumiller, T.K. and Gahn, F.J. 2002. Fossil record of parasitism on marine invertebrates with special emphasis on the platyceratid-crinoid interaction. Paleontological Society Papers 8: 195-210. Brett, C.E., Cramer, B.D., McLaughlin, P.I., Kleffner, M.A., Showers, W.J. and Thomka, J.R. 2012. Revised Telychian–Sheinwoodian (Silurian) stratigraphy of the Laurentian mid-continent: building uniform nomenclature along the Cincinnati Arch. Bulletin of Geosciences 87: 733–753. Feldman, H.R. 1989. Taphonomic processes in the Waldron Shale, Silurian, southern Indiana. Palaios 4: 144-156. Gahn, F.J. and Baumiller, T.K. 2006. Using platyceratid gastropod behaviour to test functional morphology. Historical Biology 18: 397-404. Gahn, F.J., Fabian, A. and Baumiller, T.K. 2003. 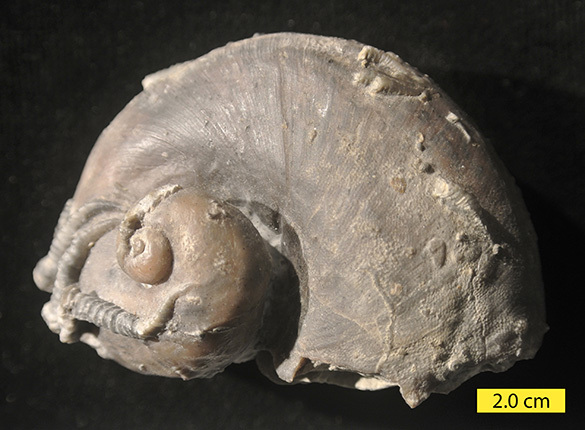 Additional evidence for the drilling behavior of Paleozoic gastropods. Acta Palaeontologica Polonica 48: 156-156. Liddell, W.D. and Brett, C.E. (1982). 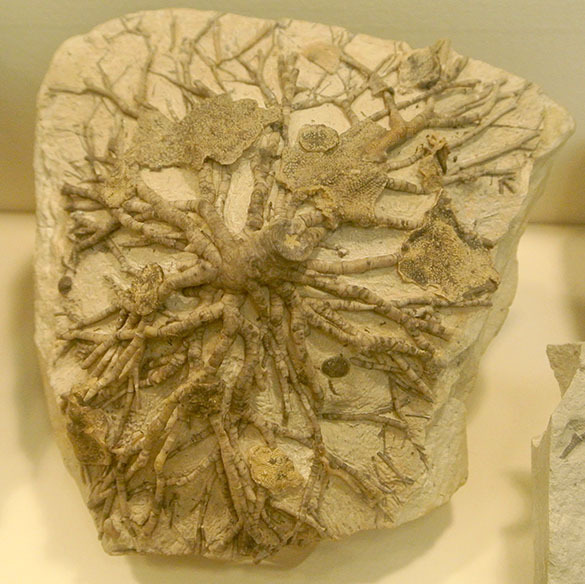 Skeletal overgrowths among epizoans from the Silurian (Wenlockian) Waldron Shale. Paleobiology 8: 67-78. Peters, S.E. and Bork, K.B. 1998. Secondary tiering on crinoids from the Waldron Shale (Silurian: Wenlockian) of Indiana. Journal of Paleontology 72: 887-894. Sutton, M.D., Briggs, D.E.G., Siveter, D.J. and Siveter, D.J. 2006. 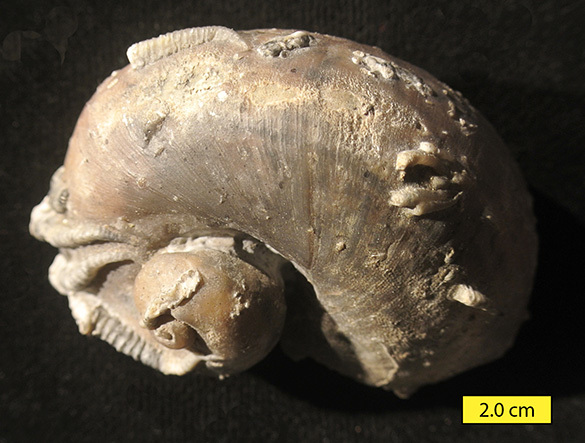 Fossilized soft tissues in a Silurian platyceratid gastropod. Proceedings of the Royal Society B: Biological Science 273(1590): 1039-1044.